Deflated Japan skipper Maya Yoshida has stated his questionable late handball, punished by the video-assistant referee, in defeat during the Asian Cup final had reopened old wounds from Southampton’s painful League Cup reversal to Manchester United. Forward Akram Afif effortlessly converted from 12 yards in the 83rd minute to make it 3-1 to Qatar after the Saints centre-back was, belatedly, adjudged to have illegally stopped 2018 AFC Player of the Year Abdelkarim Hassan’s header at Zayed Sports City. Intent was hard to judge as Yoshida’s outstretched arm made contact when he was looking the other way, but the punishment killed any hope of a comeback by the record four-time champions from 2-0 down. On club duty back in February 2017 for the League Cup final, Italy striker Manolo Gabbiadini was incorrectly adjudged to be offside when scores were goalless in an eventual 3-2 loss against the Red Devils. There was no VAR that day, providing a different sort of pain for Yoshida. “Probably one of them,” the 30-year-old replied when asked whether the weekend loss was one of the most disappointing of his career. “Because losing in a cup final or tournament final is really difficult to accept. “Even when we had Manchester United before in the League Cup final, big defeat. Also, Manolo Gabbiadini scored and it was given offside. Outstanding strikes from nine-goal record scorer Almoez Ali and Abdulaziz Hatem had put Qatar 2-0 up by 27 minutes, prior to Takumi Minamino’s intricately constructed 69th-minute effort. From the moment that referee Ravshan Irmatov referred to the outside officials after Yoshida’s block, however, hopes of extra time dissipated. “It’s the toughest ways to lose in the final,” said Yoshida, marking his 96th international cap in agonising fashion. “First of all, congratulations to Qatar. “They had the aggression, even though they have only two days in between. We were too passive in the first half and when you concede two goals in the first half, it’s going to be really difficult to come back from that. Yoshida is one of few veterans to have survived the cull that followed the World Cup run to the round of 16, where Samurai Blue alarmed red-hot favourites Belgium. New head coach Hajime Moriyasu selected an experimental squad for the UAE, that was nevertheless still expected to claim a fifth trophy since 1992. Amid the pain of defeat, Yoshida hoped the experience had been a formative one for his nation’s fresh hopes. He said: “Hugely disappointed, today. Me individually and as a team, for all the Japanese people. “We have to learn from this defeat. We have the Copa America and after the summer we start to have the qualification for the World Cup. Yoshida will be expected to offer experience alongside emerging Sint-Truiden centre-back Takehiro Tomiyasu, 20, in the challenges to come. He could also be selected as one of three overage players for the Tokyo 2020 Olympics. 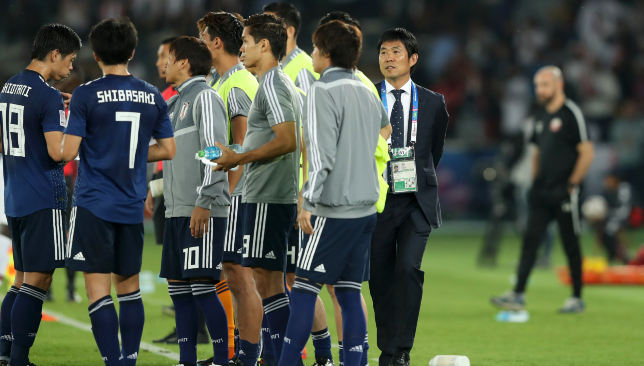 Pragmatic head coach Hajime Moriyasu has declared defeat in Friday’s Asian Cup 2019 showpiece has provided a “base for Japan to grow” in the years ahead. 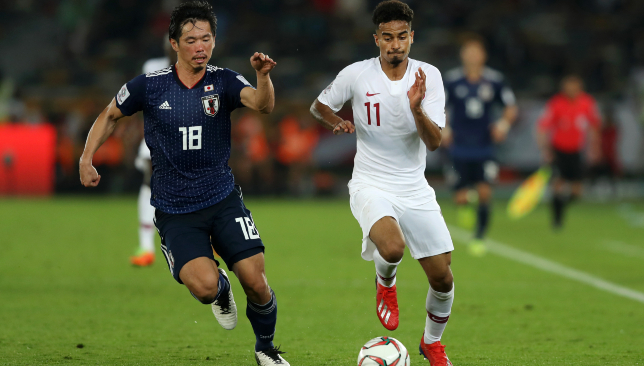 The Samurai Blue selected a youthful squad in the UAE, with the likes of Shinji Kagawa and Keisuke Honda leading the celebrated absentees from the group that made World Cup 2018’s round of 16. This new generation was denied a record-extending fifth continental triumph because of final-debutants Qatar’s 3-1 victory at Zayed Sports City. Moriyasu, however, was convinced valuable lessons had been learned by the likes of highly rated Groningen winger Ritsu Doan and Sint-Truiden centre-back Takehiro Tomiyasu on the way to the 2019 Copa America, Tokyo 2020 Olympics and World Cup 2022. “The goal was to be champions,” said the 50-year-old former Japan midfielder, who assisted Akira Nishino in Russia. “This meant a lot for the team. “We wanted a mixture of young and experienced players. By playing seven matches, we could improve ourselves in different types of matches. “I want to thank the experienced players for their approach and for young players expressing themselves on the field. I want young players to keep staying hungry after this result. “This tournament will be the base for Japan to grow a team from now on. My role is to watch the process of how things are going. Qatar went ahead in the 12th minute when striker Almoez Ali produced an elegant overhead kick and became the highest scorer in a single Asian Cup with nine goals. Midfielder Abdulaziz Hatem doubled the lead on 27 minutes with a refined curled shot from 25 yards. 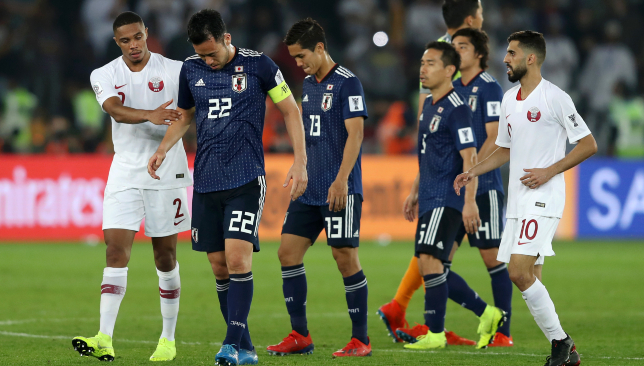 Takumi Minamino’s intricately-worked dinked effort on 69 minutes caused the Qatar defence to be breached for the first time in the competition. All hope, however, of a comeback was snubbed out when skipper Maya Yoshida handled 2018 AFC Player of the Year Abdelkarim Hassan’s header and the video-assistant referee awarded a penalty that was confidently converted by forward Akram Afif. Moriyasu said: “We lost the first goal when there was a mismatch in the systems. We made our preparations against Qatar knowing they’d play three defenders, but it’s my responsibility that the players couldn’t express their strengths on the pitch. “Losing the first two goals made it difficult. We had chances to tie it, but it was very difficult. Japan are next scheduled to play friendlies against Colombia and Bolivia in March. Qatar claimed a first-ever Asian Cup thanks to a 3-1 victory against record four-time champions Japan in Friday’s final. The Maroons, who made their debut in the tournament’s showpiece, soaked up early pressure and pounced through striker Almoez Ali’s 12th-minute overhead kick. His ninth strike in the UAE saw him move ahead of Iran icon Ali Daei as the competition’s highest scorer at a single running. Another fine goal followed on 27 minutes at a near-full Zayed Sports City when midfielder Abdulaziz Hatem curled in from 25 yards. This represented a second assist of the night for forward Akram Afif and a, remarkable, 10th of the 2019 edition. The World Cup regulars of Japan, belatedly, stirred into life after the interval and earned a lifeline through attacker Takumi Minamino’s well-worked chipped finish that ended Qatar’s run of clean sheets in the competition. But the half’s other goal would come for the Maroons, the outstanding Afif calmly converting an 83rd-minute penalty-kick once Yoshida’s handball from 2018 AFC Player of the Year Abdelkarim Hassan’s header was retrospectively punished by the video-assistant referee. Unsurprisingly, changes were at a premium in the capital. Al Ain’s Tsukasa Shiotani came in for Sint-Truiden’s Wataru Endo in defensive midfield for Samurai Blue, while Al Duhail centre-back Bassam Al Rawi was back from suspension for Qatar and Al Gharafa’s Hatem was productively recalled. A cagey contest had been expected between the combatants in front of more than 36,000 spectators, with Japan cast as slight favourites. But watched on by dignitaries that included FIFA president Gianni Infantino, AFC president Salman bin Ibrahim Al Khalifa, Real Madrid legend Luis Figo plus Manchester United and South Korea hero Park Ji-sung, Qatar would race into a 2-0 lead before the half-hour mark. Villarreall-owned Afif punted a ball into the centre. Al Duhail’s Ali, under pressure from Southampton defender Maya Yoshida, took two deft touches and then athletically produced an overhead kick without the ball hitting the ground. Yoshida would block a dangerous Ali shot almost from the restart. But Qatar would go further ahead soon after. Hatem received possession under no pressure, looked up and stroked the ball home with his left foot. The post soon came between sliding skipper Hassan Al Haydos and a 3-0 advantage. Samurai Blue boss Hajime Moriyasu, renowned for his conservative outlook, needed to inspire a remarkable turnaround in his nation’s fifth showpiece appearance in the last nine runnings. Hatem, however, would volley the second half’s first chance wildly over in the 56th minute. At the other end, substitute Yoshinori Muto would head off target within a minute of coming on just after the hour mark. A way back into the contest would come in the 69th minute. Shiotani fed the ball into Werder Bremen forward Yuya Osaka, whose lay off played Red Bull Salzburg’s Minamino into a one-on-one he cutely dispatched with a dink over Al Sadd goalkeeper Saad Al Sheeb. The expected cavalry charge from Samurai Blue, however, did not take place. Qatar, like they’d done all tournament, were happy to sit deep and strike on the break. A foray up the pitch won a corner in the 80th minute. Hassan’s header struck Yoshida’s outstretched arm, with Afif doing the honours from 12 yards after VAR’s intervention.